King OFF the road – that’s how Toyota describes the updated 2016 LandCruiser 200 Series. While I don’t see why it isn’t one, I think it might as well be the “King OF the road”. 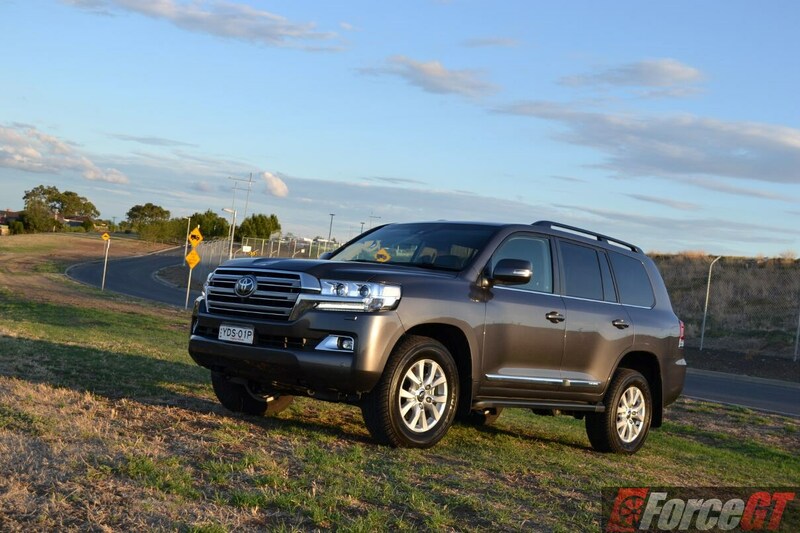 This behemoth is 60mm longer, 105mm wider and 65mm taller than the already large LandCruiser Prado. 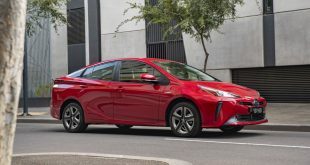 It weighs an almost truck-like 2.7 tonne and packs a 138-litre fuel tank – this thing will keep going when everything else on the road has run out of fuel. Well, that’s not entirely true, because the one-size-down Prado has a larger 150-litre tank (to my surprise). 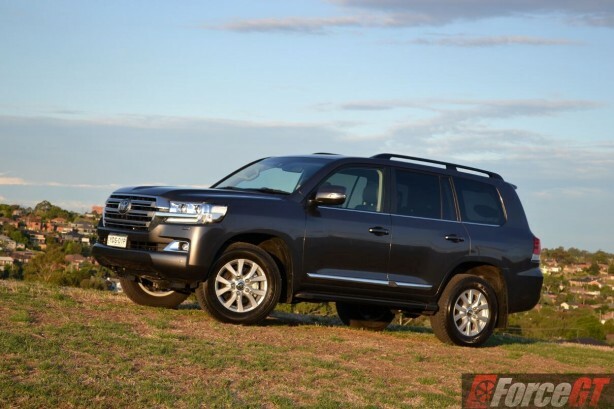 For decades, the LandCruiser has been the best-selling body-on-frame, four-wheel-drive vehicle in Australia. We have bought more than one in 10 of all LandCruisers ever built, making this country the largest single market for the off-roader in the world. 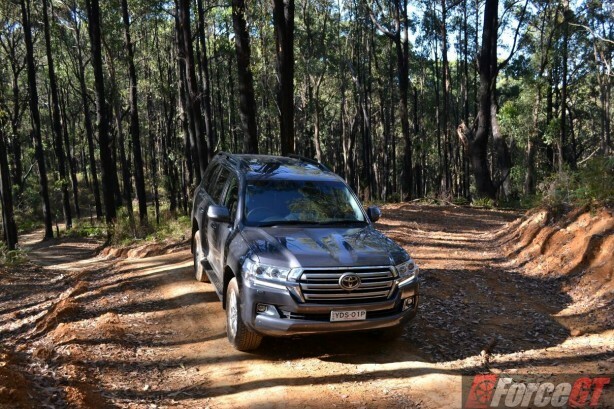 Ironically, since the early days every generation of LandCruiser has been tested and pushed to the limit in the Australian Outback – considered by many to be one of the world’s toughest environments in both temperature and terrain. 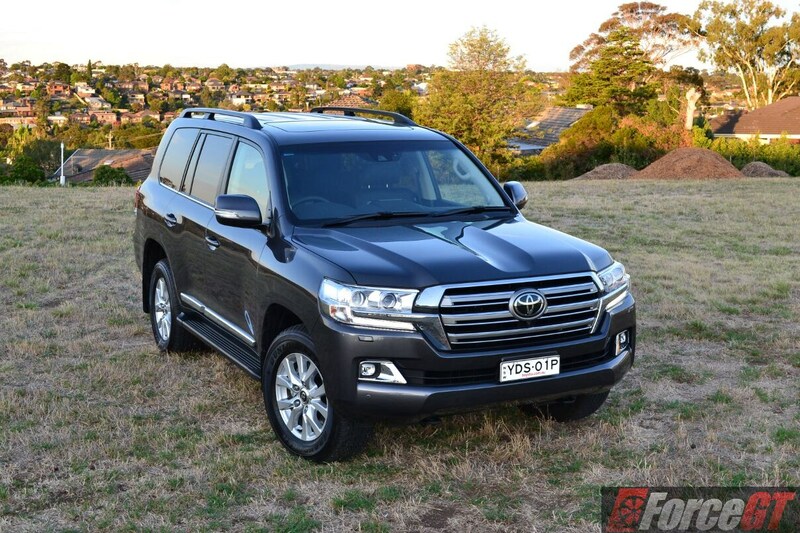 This is why the LandCruiser has been the vehicle of choice for the UN, as well as the… terrorists, because short of an armoured vehicle, nothing will get you as far into, and out of, a hostile place than a Toyota LandCruiser. So, for 2016 the big daddy of all off-roaders has been given some styling enhancement, performance tweaks and safety advances to ensure it stays at the top of the food chain. 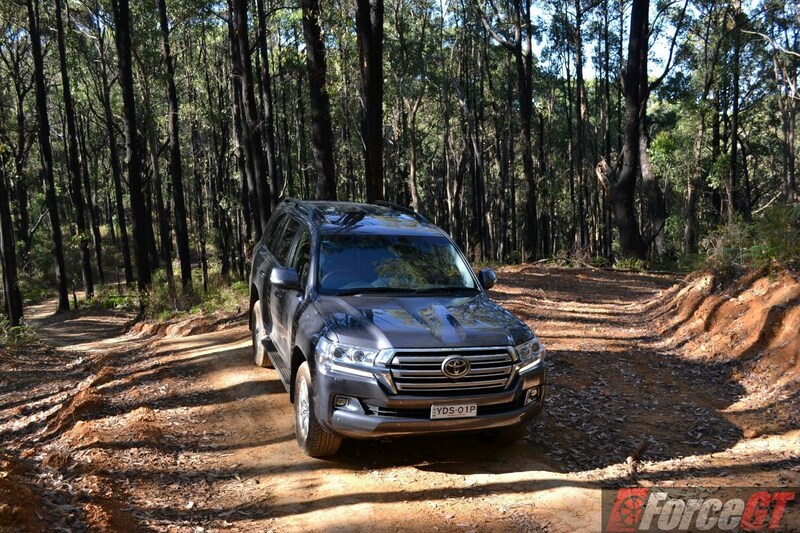 And I was supplied the top-spec model for evaluation – the $118,500 (excluding on-roads) LandCruiser 200 Series Sahara. Visually, the biggest improvement occurs at the front, where the cosmetic updates are also the most obvious. A revised grille, new headlamps, restyled bumper, fenders and bonnet contribute to a wider and less arresting front profile. 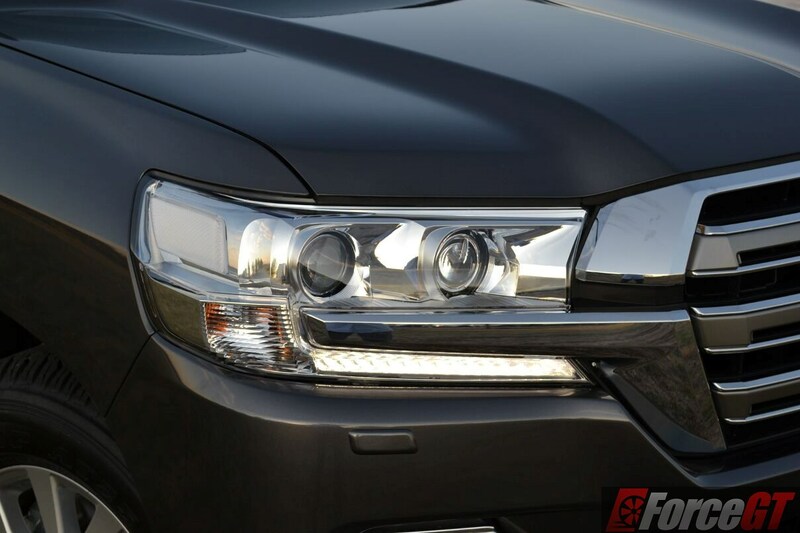 The new grille, with a hexagonal frame and triple horizontal bars, extends out to the headlights to interrupt their visual bulk, resulting in a more aggressive and prominent look. This is accentuated by subtle scooping in the centre of the bonnet for a more modern appearance. 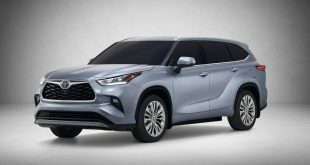 Elsewhere, side protection mouldings and door handles have been revised while the rear makeover includes a new bumper, upper tailgate panel, combination lamps, reflectors and mudguards. 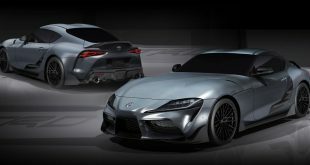 In contrast with the front, changes to the rear are more subtle, though a similar design theme is maintained. The wider licence-plate garnish extends into the restyled combination lamps to emphasise width while unifying the rear design. 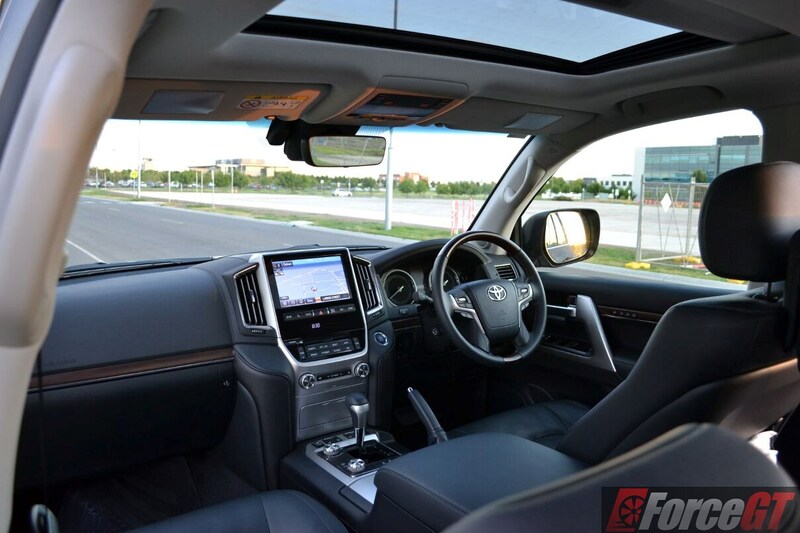 Inside, soft padding has been adopted for the both sides of the centre console, and in general there’s a slight lift in material quality and treatment of edges. 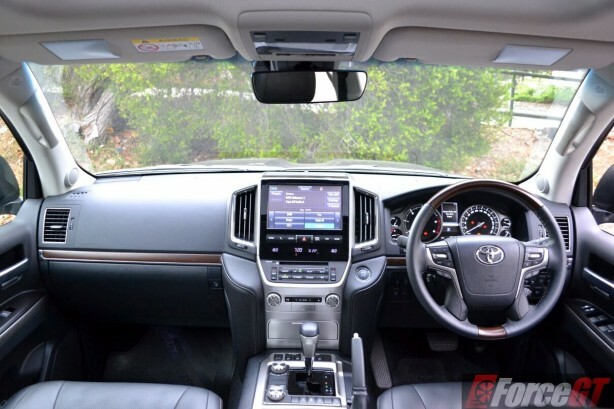 The dashboard is still a myriad of buttons and knobs but they have been shuffled around in a new layout with logical groupings, yielding improved ergonomics and usability. The centre cluster gains a storage area, 12V outlet and a wireless charger. There’s also a newly designed Optitron instrument cluster with 4.2-inch colour Multi Information Display. The 9-inch centre touchscreen is an inch larger than before, but still suffers from glare on a sunny day. Of course, being the top of the range model, the Sahara is fitted with every luxury feature conceivable. 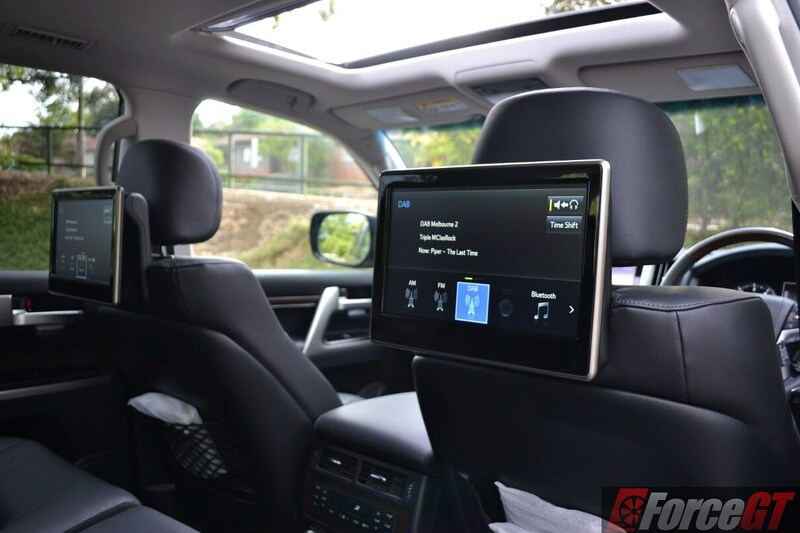 Automatic LED headlights, adaptive cruise control, full leather upholstery, front and rear parking sensors, moon roof and a 9-speaker entertainment unit with digital radio are all there. 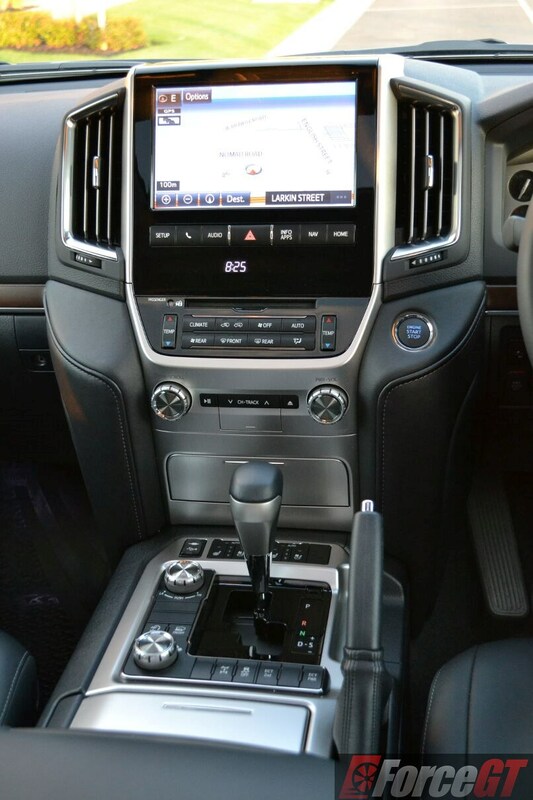 So are the electrically adjustable front row seats and steering column, heated first and second row seats, ventilated front seats with active headrest, keyless entry and push button start, powered tailgate and four-zone climate control system. 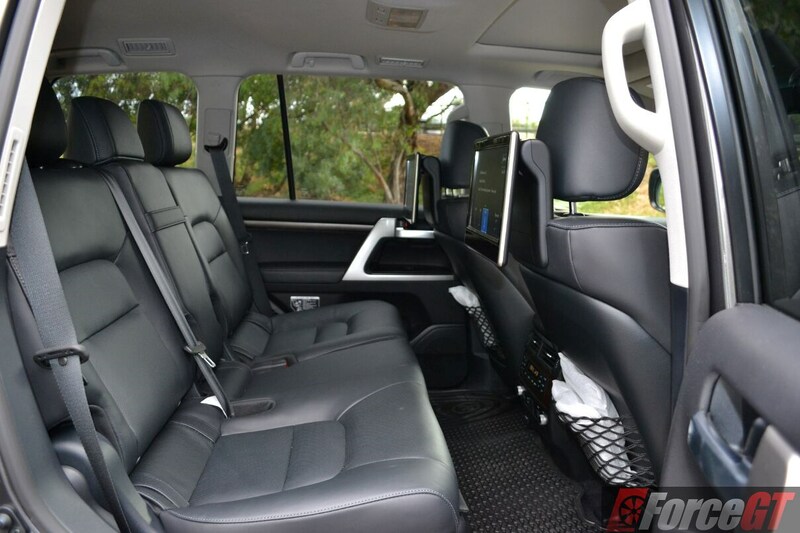 The revised rear-seat entertainment with screens mounted on the back of the two front seats ensure the kids stayed entertained on long trips. The system comes with a 12V outlet, HDMI/USB connectivity, remote control and wireless headphones. 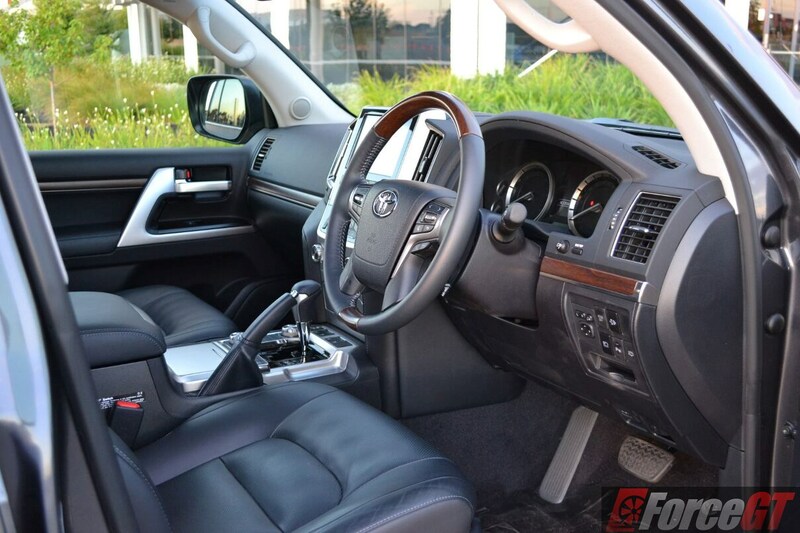 The Sahara’s lavishly fitted interior is so vast you can almost say “it feels cold in here”. 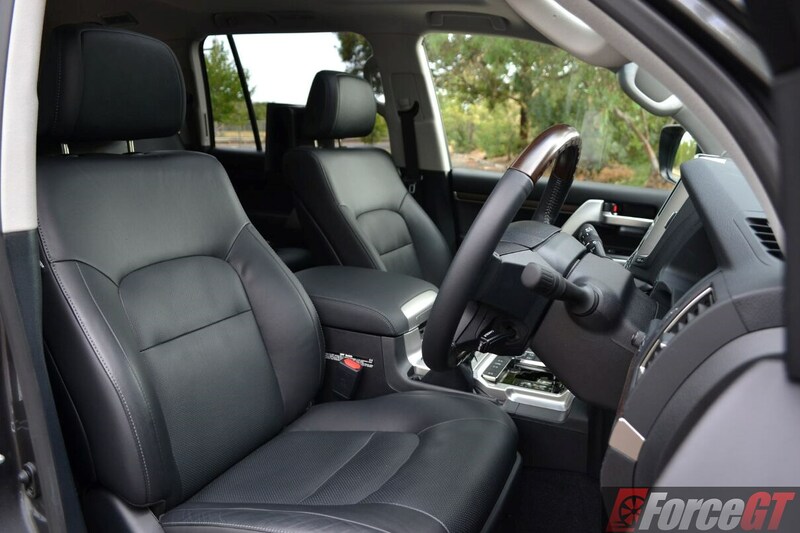 It’s adorned with premium materials and has good cabin lighting. 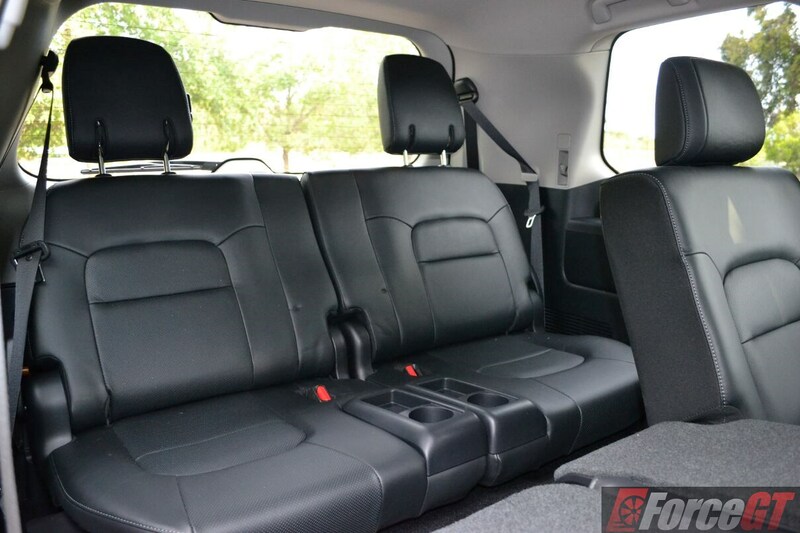 There is seating for seven, with generous headroom and legroom for the first and second row occupants. The enormous width of the vehicle means three adults seated in the second row don’t have to rub their arms against each other. Two adults would fit in the third row bench but only for short trips as legroom is fairly tight, even with the second row seats slid forward. 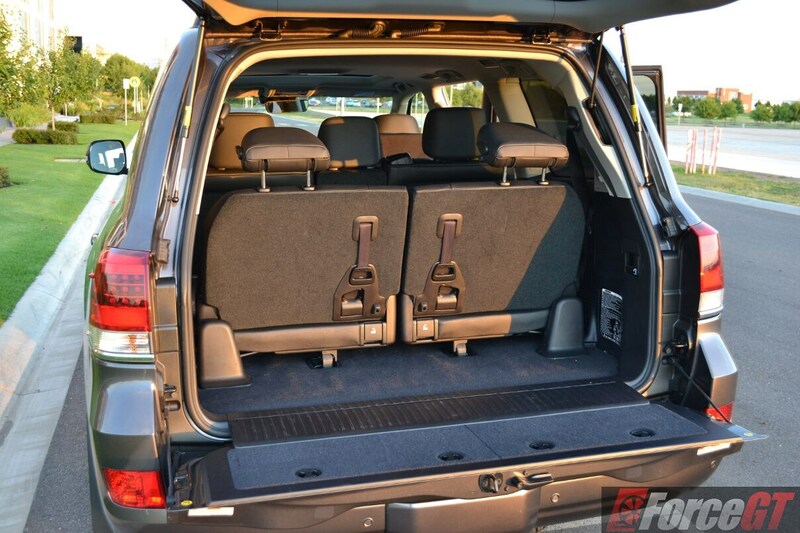 With the third row stowed, the LandCruiser has 1,276 litres of cargo space, which expands to a sizeable 2,322 litres when the 40/20/40 split second row is tumbled. While the liberated space is extensive, I’m personally not a fan of the third row seats folding to the side of the cargo area, as this setup takes away a lot of available space. And they are permanently bolted to the floor so removing them is not easy. 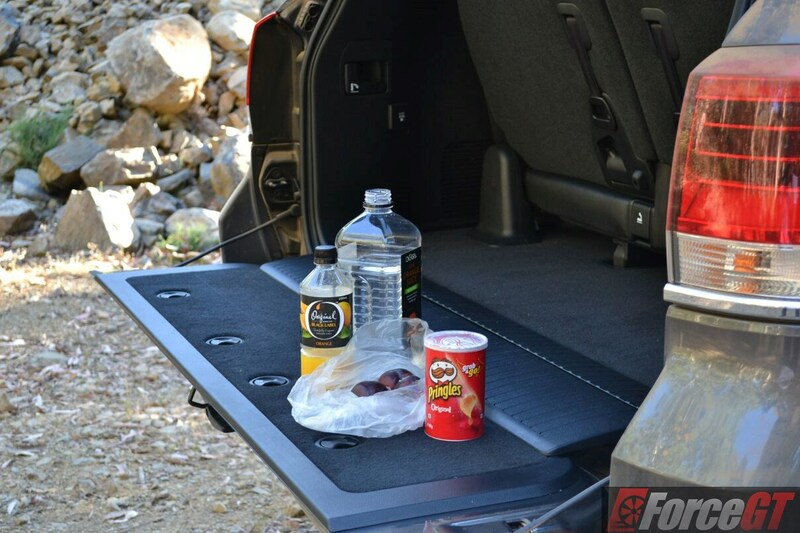 The two-piece split tailgate is a nice touch, as not only you don’t need to have two acres of space behind the car to open the tailgate, the lower part can be used as a tray or a sitting bench. 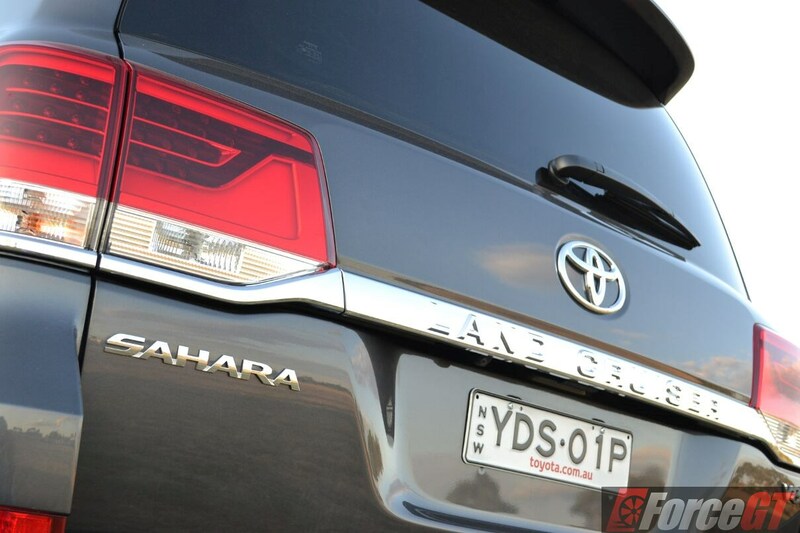 The LandCruiser Sahara I sampled is powered by a 4.5-litre twin turbo V8 diesel engine producing 200kW (an increase of 5kW over previous) and a colossal 650Nm of torque available from a low 1,600rpm. 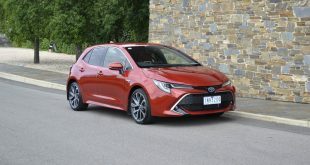 It is one of the smoothest diesel engines I have come across – its refinement rivals even some petrol engines and from within the cabin, there’s barely a hint of diesel clatter. Despite its heft, the Sahara is no slouch, as the mighty V8 urges the behemoth along with surprisingly linear power delivery for a diesel. 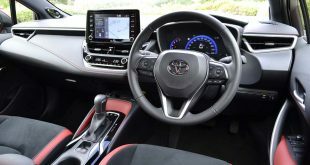 The six-speed automatic transmission it’s paired with is equally slick and impresses with its ability to pick the perfect gear for all occasions, be it in a descent, going up a hill or hustling along urban traffic. After my weeklong test covering over 500km of mix city, country and off road driving, the trip computer’s average fuel consumption of 13.9L/100km isn’t too shabby but not that great either. In the real world, it would struggle to meet the 9.5L/100km figure claimed in the brochure. 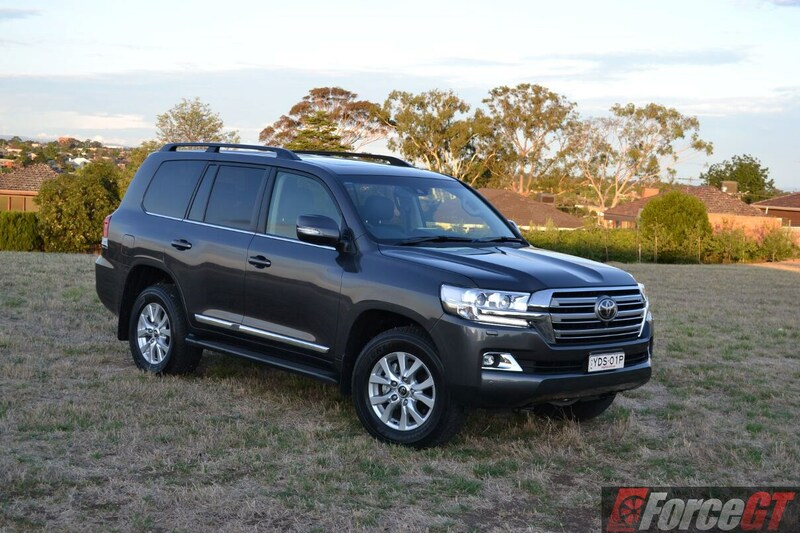 However, the LandCruiser is about capability, not fuel economy. 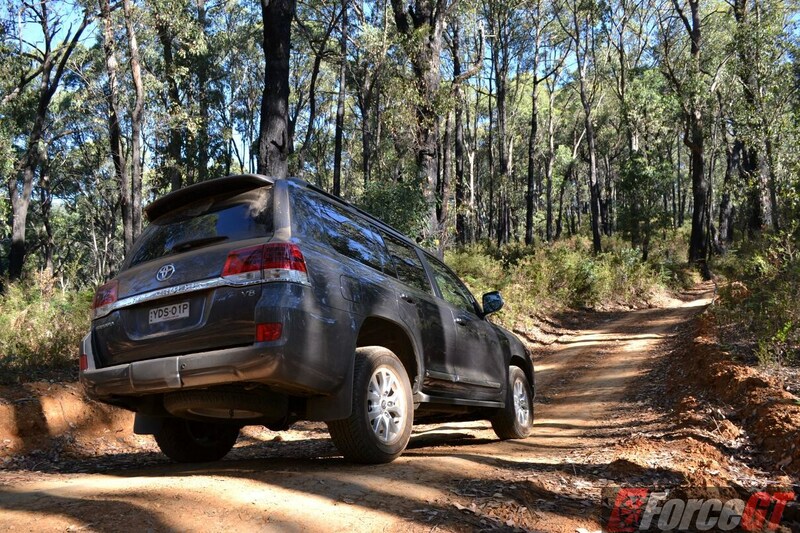 When it comes to off road work, the LandCruiser is second to none. 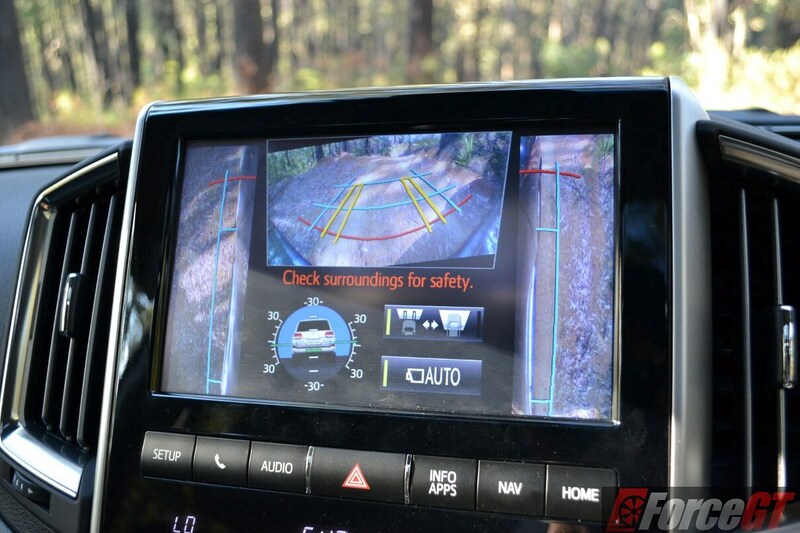 With banks of 4WD chassis and electronic aids – Crawl Control with optimisation for different surfaces and turn assist, Downhill Assist Control, Hill-Start and Hill-Descent Assist, lockable centre and rear differential, full time 4WD with high/low range and Multi-terrain ABS – the LandCruiser packs tremendous off road ability. Crawl Control is particularly effective on tough tracks. 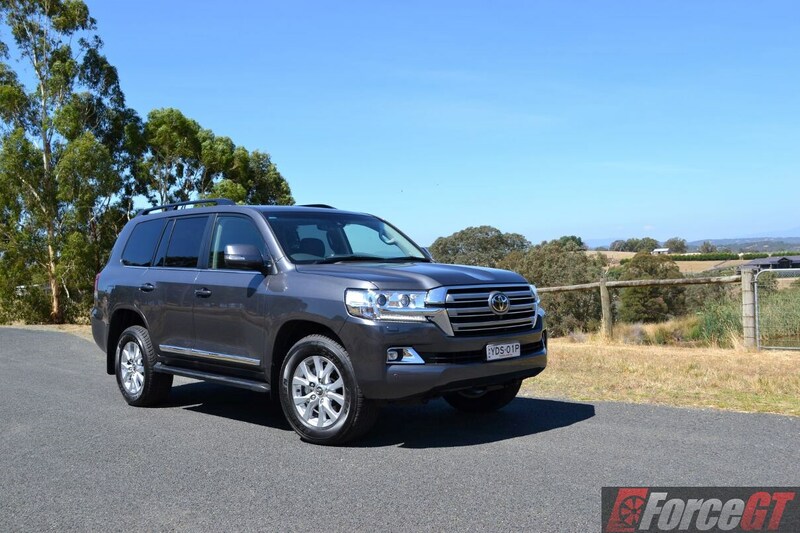 Set it to suit the surface underneath, pick a suitable crawl speed and the LandCruiser, with that beefy V8, would simply traverse the terrain like a walk in the park. No dramas. Another trick up the Sahara’s sleeve is the Australian developed and tested Kinetic Dynamic Suspension System (KDSS) which offers two previously contradictory benefits: long wheel articulation for challenging off-road driving and roll suppression required for on-road cornering flatness. 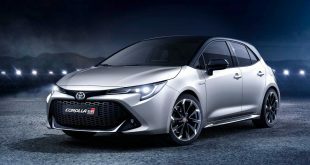 It’s like a suspension with two characteristics: maximum suspension travel to keep the wheels in contact with the ground off-road, and minimum roll to ensure the body doesn’t lean too much on corners. And it’s mighty effective. The 2016 update sees the Sahara fitted with cameras that allow easier manoeuvring of the large SUV. The in-car touchscreen can now display panoramic view around the Sahara using four cameras – front, rear and in the side mirrors – to provide added confidence with the placement of wheels, both when moving forward and reversing. The front camera now rotates so that the horizon is always displayed as level on the in-car display to provide drivers with an intuitive understanding of the tilt angle of the vehicle. An under-floor view, displaying images taken approximately 3m ahead of the vehicle, allows drivers to see where the front wheels are placed. This is particularly useful when crossing log bridges. As part of the update, the Sahara also adopts new safety features that include a pre-collision system, dynamic radar cruise control, lane-departure alert, and blind-spot monitor with rear cross-traffic alert. 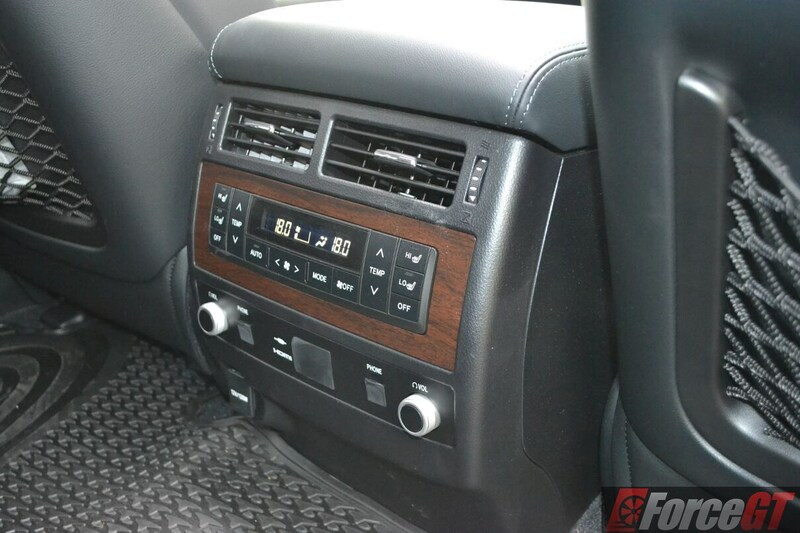 These are in addition to ten airbags, vehicle stability and active traction control, and trailer sway control. 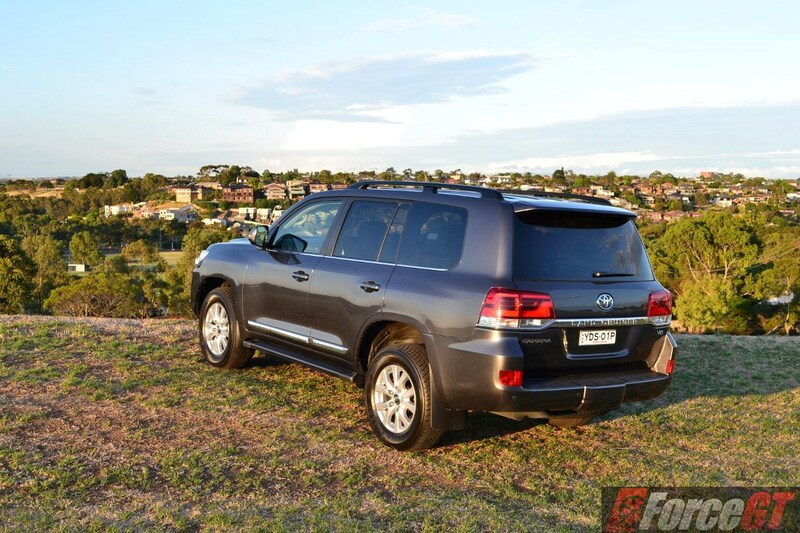 The 2016 Toyota LandCruiser 200 Series continues to deliver benchmark go-anywhere performance that is hard to match. 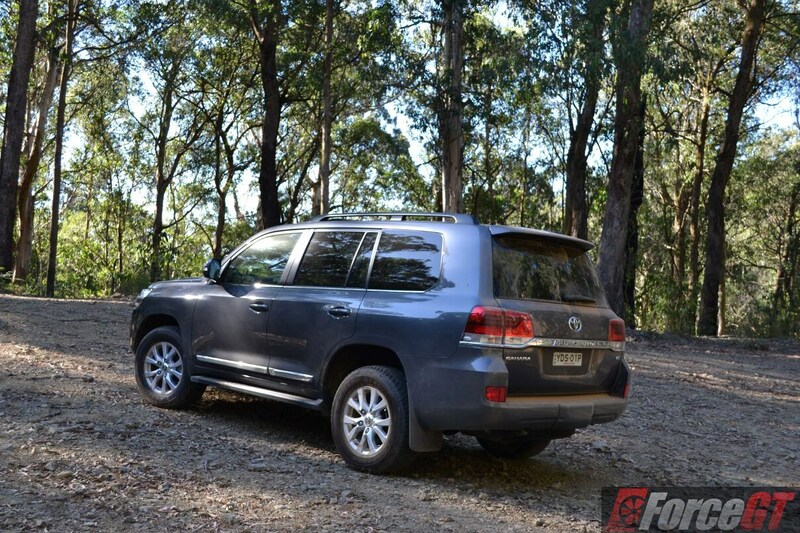 At just shy of $119k excluding on-roads, the top-spec LandCruiser Sahara is premium money but buys you loads of kit, a luxurious cabin for the family and all the technology you need for your off-road excursion. 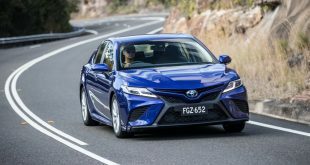 While the diesel engine isn’t as efficient as I’d hoped, it impresses with good refinement and strong power delivery that adapts well both on and off road. 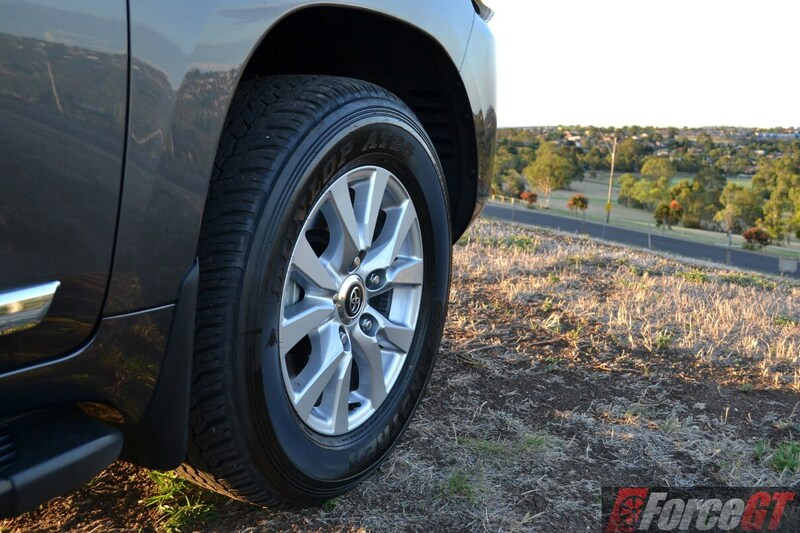 With a tough and proven 4WD drivetrain, the LandCruiser 200 remains the SUV of choice for Outback adventures, long distance cruising and caravan hauling.